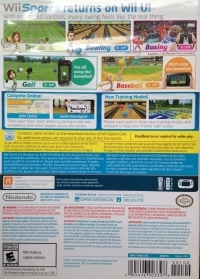 Box Text: Wii Sports returns on Wii U! With enhanced controls, every swing feels like the real thing! Show your team spirit online by joining a club and competing with other players across the nation. Master each sport in three new training modes, and compete to beat your friends' high scores. 07-08-2015 aliensstudios Box Text Wii Sports returns on Wii U! With enhanced controls, every swing feels like the real thing! Compete Online! Join Clubs! Send messages! Show your team spirit online by joining a club and competing with other players across the nation. New Training Modes! Master each sport in three new training modes, and compete to beat your friends' high scores. 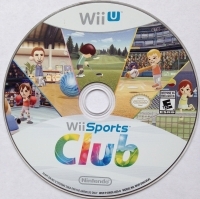 This is a list of VGCollect users who have Wii Sports Club in their Collection. This is a list of VGCollect users who have Wii Sports Club in their Sell List. 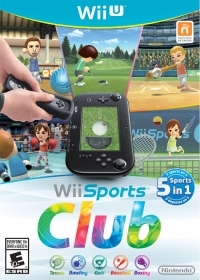 This is a list of VGCollect users who have Wii Sports Club in their Wish List.